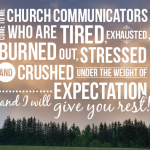 Church communicator burnout is a serious issue. We do important work—sharing the gospel—but that doesn’t mean we can work ourselves to death. We have to take care of ourselves. Communication is a marathon, not a sprint. 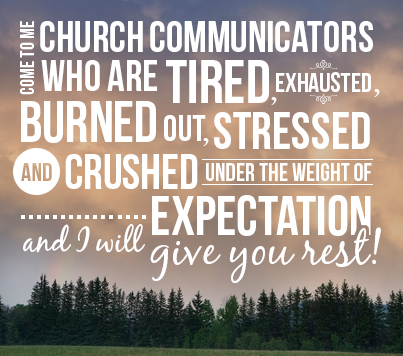 So learn more about church communicator burnout and how to take better care of yourself. Admit It: It’s OK if you’re losing steam. Re-evaluate the situation, take a break and maybe consider rearranging your schedule. Dying Empty: It’s not about feeling drained at the end of the day, but about giving yourself a fulfillable purpose each day. Quit Something: You might need to quit something good in order to focus on something great. Just Say No: When you’re a church communicator, so much stuff can be piled on you that you feel like you might burst at the seams! At that point, you only have three options, and one of them may be to just say no. Office Hours: More hours doesn’t mean more productivity. Create boundaries and stick to them. Separation of Church and Life: Working in a church is hard! Build a good culture by scheduling other back-up support members so you’re not always getting hauled out of the service every time there’s a crisis. Disagree Well: Sometimes you’re going to disagree and your pastor will pull rank. Learn how to deal with disagreement and still get the job done. This isn’t a shock to you. So don’t keep living as if it is. Not an Expert: It doesn’t mean you’re doing it wrong if you’re not an expert in everything. Allow yourself to ask for help without shame. Even if you don’t know everything, you have something figured out. Redefine Excellence: It can be easy to think you’re failing if everything isn’t perfect. Don’t fall into that trap. Redefine excellence by seeing it as doing the best with what you have. Comparisons: Don’t compare yourself to others. Your success shouldn’t be measured by what the church down the road does. Keep Your Ego in Check: Sometimes other ministries and pastors expect too much, but sometimes the problem is our own ego. Refuel: You can’t be wonderfully creative all the time. It’s not a water faucet you can turn on and off. Take the time to refuel your creativity. Burning out isn’t always about late hours at the office—it’s often about how you’re doing on the inside. Are you seeing any warning signs in your life? Know Yourself: Doing some introspection might be healthy. To be a good church communicator, you have to make peace with who you are and what your limitations are. Rest & Recharge: When was the last time you “recharged”? Adam Legg provides good tips for letting yourself rest. Read your Bible: It should be a no-brainer, but working in ministry can easily cut into your devotional time. These verses (submitted by fellow church communicators) are meant to help get you in the groove again. You can also check out the devotional for creatives, Created for More. Give Thanks: Take time to reflect on your first day of work and be grateful for all you’ve been given since then. Giving thanks can be an amazing way to remind yourself what you love about being a church communicator. This may sound like a typical church answer but for me this has all been about Jesus. The pressure, stress and expectations are there every single day and if I let those things control my life I am finished right from the beginning, however I really believe that Jesus meant it when he said, “Come to me, all who labor and are heavy laden, and I will give you rest.” I think that too often we forget those promises are for us. But sometimes, you get burned. What can you do when that happens? And when you’re ready, you look back to see what you learned, and you move on.